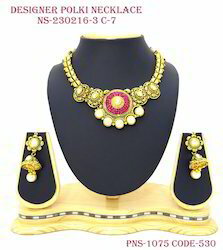 Fine Decorative Brass Stone Designer Necklace With Beads Available In Different Designs & Sizes. We are highly acclaimed manufacturers involved in offering Flower Design Kundan Necklace to our esteemed clients. These are manufactured at our state-of-the-art infrastructure facility and are highly acclaimed for being elegant. These are often used as statement neck pieces and are available to clients at economical costs. 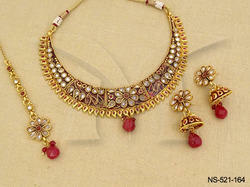 This Flower Design Necklace Set is exclusively designed so that it is aesthetically appealing. .We offer our clients a huge gamut of supreme quality Fabric Flower Embroidery Necklace that is widely appreciated for its gorgeous designs and alluring patterns. Crafted by highly skilled professionals, this range is widely used in the for making ladies garments. The offered range can be customized in the terms of colors and sizes.